1855 Wass, Molitor & Co. $50. K-9. Rarity-5. AU-55 (PCGS). 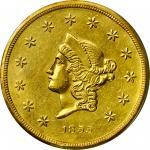 This is an outstanding example of a classic rarity in the privately issued California Gold Rush coinage series. Exceptionally well produced and preserved, both sides exhibit bold to sharp striking detail throughout the design, with most features fully rendered. The vivid golden-yellow surfaces offer a bright satin finish with modest semi-reflectivity in the fields under a light. Wispy hairlines are present, as typically noted in survivors of this type, although they are far fewer in number and less noticeable than usual. There are also remarkably few abrasions for a $50 gold coin from Gold Rush California, a short reeding mark in the central reverse field above the letters LA in DOLLAR being the most useful identifying feature. Conservatively graded by todays standards, this is a very smooth and remarkably lustrous example that has the appearance of an MS-60 or MS-61 grade. It is sure to attract strong bidding from specialists.ppThe story of Wass, Molitor & Company has its beginnings in the Austro-Hungarian Empire and the 1848-1849 war for Hungarian independence. Born in Hungary, Count Samuel C. Wass and Agoston P. Molitor both studied metallurgy in Germany before returning to their native country to pursue their careers in the Hungarian mining regions. There they remained until the winds of revolution that had been swirling around Europe swept into Hungary culminating in a declaration of independence from the Austro-Hungarian Empire on April 18, 1848. Quickly Poland allied with the Hungarian revolutionaries and war against Austria and the Hapsburg emperor spread throughout the region. The war was finally suppressed in October of 1849, and many of the pro-Hungarian independence revolutionaries were forced into exile, including both Wass and Molitor. Seeing opportunity in North America, many Hungarian expatriates arrived in the United States just as the California Gold Rush was gathering momentum.ppArriving in California from the Old World, these immigrants found a booming economy struggling to cope with explosive growth. Within two years of the discovery of gold, the population in Northern California had quadrupled and continued to grow every day. Unfortunately, the money supply did not grow at the same rate and coinage of any sort was scarce. Transporting freshly mined gold to the mints back East was a long and arduous process and repeated petitions for a branch mint made to Congress back in Washington were met with opposition and would be held up for several years. While other parts of the country would address such monetary crises with currency, in the West paper was met with almost universal distrust. Indeed this was codified into Article IV section 34 of the 1849 California Constitution which forbade any bank to "make, issue, or put in circulation, any bill, check, ticket, certificate, promissory note, or other paper, or the paper of any bank, to circulate as money." Gold dust proved useful as a stop-gap measure but could be easily adulterated and its purity could not be consistently assured. Many local jewelers and assayers attempted to fill the need for coins but these efforts met with varying degrees of success. ppSamuel Wass arrived in San Francisco in October 1850 and set immediately to work in the California gold fields. He produced a detailed geological report of the region which was published in the Alta California on January 13, 1851. Wass prefaced his report with the following explanation as to his reasoning behind his journey to the West:ppemGentlemen-As a native of a mining country in Europe I have felt a great deal of interest in all that I have heard and read about this country. My curiosity was highly excited during my sojourn in the States, having received so many accounts of the extraordinary formations and riches of nature in California. I made up my mind to visit the place in the company with two friends…/emppWass quickly established a reputation as a highly regarded expert in metallurgy and the latest mining technology from Europe. Sometime in early 1851, Molitor arrived to California and soon joined his fellow expatriate. On October 14, 1851, the pair announced the formation of Wass, Molitor & Co. as an assay office located in San Francisco on Montgomery Street below Bush Street. Success came quickly to the firm and they relocated to the fireproof building formerly occupied by banker and Civil War general Henry M. Naglee, on the corner of Montgomery and Merchant streets. There, they set up an extensive smelting operation and assay laboratory that was widely praised in the local newspapers for its modernity. At least one newspaper noted that the firm did not endeavor to produce their own coins but rather used whatever was on hand to pay depositors. This may have been the impetus for the assayers to contemplate entering the coining business. In January 1852, Wass, Molitor & Co. announced that they were prepared to begin producing what they referred to as "small coin" in $5 and $10 denominations. The purity levels fell below federal standard, so to compensate, the coins were made slightly heavier. 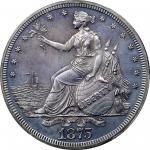 Their coins soon fetched a premium in circulation and were eagerly accepted in trade. The amount of these coins that were struck is not known, but may have been sufficient that no further coining operations were required for the next two years.ppIn the meantime, Congress finally granted approval for a branch mint to be established in San Francisco which commenced operations in 1854. The difficulty of acquiring the necessary parting acids for refining raw gold meant that it would be some time before the San Francisco Mint would be able to strike enough coins to relieve the regions monetary shortages. After an especially lengthy layoff at the Mint, in March 1855 a group of prominent merchants and bankers petitioned Wass, Molitor & Co. to resume coining operations. The firm responded in the Alta California that it was prepared to do so within a week. 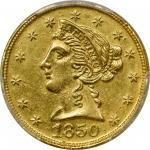 Shortly thereafter, Wass, Molitor & Co. resumed striking coins and produced $10, $20, and round $50 gold pieces. 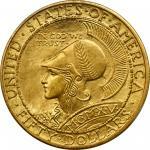 These, too, proved to be popular and circulated widely until the San Francisco Mint was able to produce the much-needed federal coins in a more consistent manner. ppThe design of the $50 piece is more functional than artistic. The bust on the obverse is small, seemingly more befitting a $20 coin. The reverse with its simple wreath surrounding the denomination resembles the contemporary fractional gold pieces. 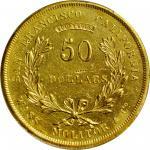 The May 16, 1855, Alta California reported that "Wass, Molitor & Co. have commenced issuing their fifty and twenty dollar pieces, at the rate of $38,000 per day. The coin is above the U.S. standard and is confidently received in trade throughout the State." 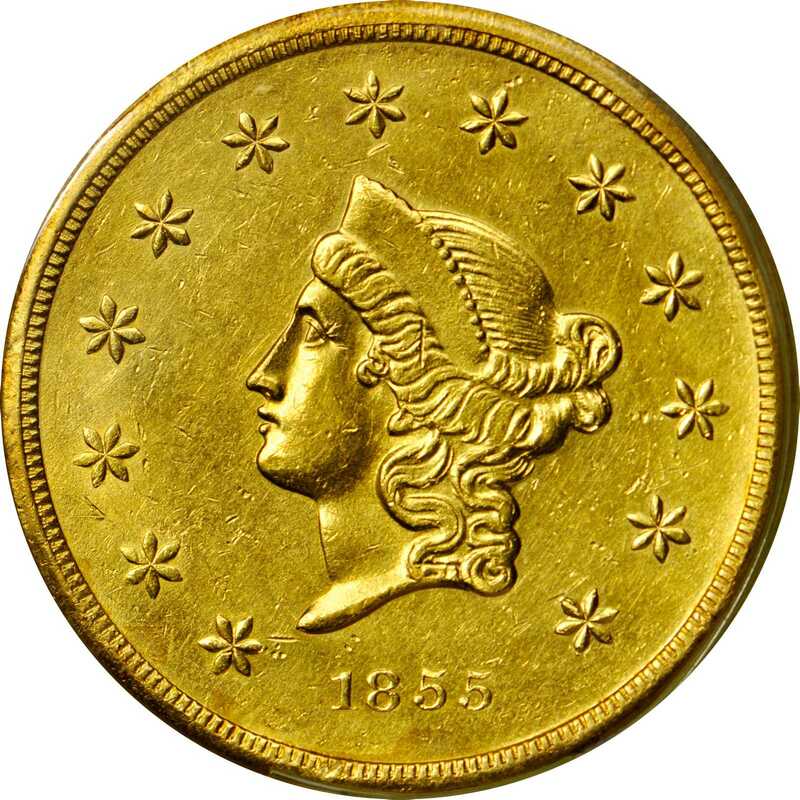 The round shape also seems to have helped acceptance of the coins since they were easier to handle than their octagonal counterparts from the United States Assay Office of Gold. Despite their brief tenure in circulation at the tail end of the private gold issuing period, the $50 coins were readily absorbed into trade. 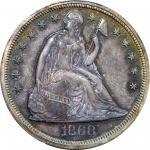 By late 1855 Wass, Molitor & Co.s coins were no longer required. Sometime in late 1855 or early 1856, Wass, Molitor & Co. dissolved and reorganized as Wass, Usznay & Co. Around this time, Wass left the region but eventually returned to continue the assay business with his son. Agoston Molitor left for London in 1856 and did not return to the United States. Premium high grade examples of Wass, Molitor & Co. coins of any denomination are of the utmost rarity and desirability in todays market, and this is particularly true of the $50 denomination. Here is an important survivor from one of the most storied of the California Gold Rush coiners.